Author VAL COMER is with us today! John Denver's hit song "Thank God I'm a Country Boy" talks about the laid-back life on a farm. With all due respect, John, I don't think we live on the same farm. It may not be very laid back, but I wouldn't trade my farm life in western Canada for anything. I find it interesting how folks are starting to take notice of farms in recent years as the worldwide economy has destabilized. Maybe some instinct is kicking in that they're very necessary, albeit not as glamorous as country songwriters would have us believe. Without them, where would our food come from? The reality is that farming is hard work and doesn't pay very well. My husband and I bought a 40-acre farm—very small by rural standards—from his parents in 2000. Both of us work outside jobs to support our lifestyle, because the farm certainly hasn't supported us. There is still romance. There is satisfaction in sitting back at the end of the day—too tired to rosin up the bow!—but seeing a field of baled hay, or a weeded garden bed, or rows of canned tomatoes in glistening jars. I love the hum of our honeybees as they gorge on a blossoming plum tree, the aroma of a riot of dill, and the rich flavor of a raspberry ripened to perfection 50 feet from my door. And so I am not surprised by the literary headlines that Farm Lit is the next big thing. With so many living in cities, far removed from the quiet of country life—quiet unless you count the barn swallows in the eaves at the crack of dawn—how folks must hunger for a taste of reality. Of nature. Of watching plants grow. Of getting their hands into the soil, of honest sweat creating rivulets down sore muscles. There is a blend, a mingling I've tried to portray in Raspberries and Vinegar, the first book in my Farm Fresh Romance series, just out from Choose NOW Publishing. Jo Shaw is certain that farming sustainably and eating a diet of local foods is the end all and be all, even though she and her friends have zero experience when they buy rundown Green Acres Farm. Zach Nemesek grew up on the property next door and he knows what the women don't. It isn't a simple life. It's a lot of hard work, and he'll be long gone (for the second time) as soon as his dad recovers from a nasty illness and can take over his own fieldwork again. Jo meets her rural trials head on while dreaming of a hunky farmer, but how could a self-respecting advocate of local food possibly fall for the junk food addicted wannabe-city-boy next door? Is there a chance Zach can, like John Denver, become thankful he's a country boy? 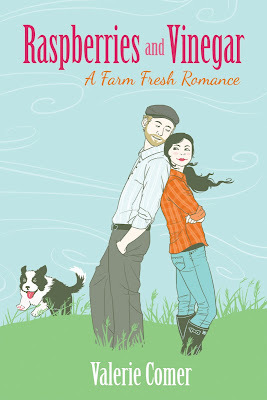 If the idea of Farm Fresh Romance with a dollop of sweet and a dash of zing sounds appealing to you, you're in luck! 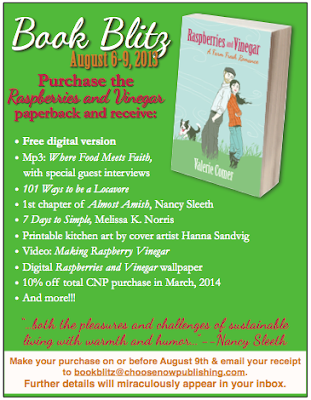 From August 6-9, anyone who orders a paperback copy of Raspberries and Vinegar can receive the digital versions as a thank you gift. We're also offering a bunch of other fun downloads: digital art, a podcast with interviews about the intersection of food and faith, a video of me making Raspberry Vinegar, and more. What about you? Do you live on a farm, do you wish you did, or are you happy to be a city girl, thank-you-very-much? Have a blast with your new book and this promotion, it sounds like a blast! chemicals by promoting local foods and sustainability. Welcome to the Inkwell, Valerie! I know you are very busy with the new release and we hope our readers and lurkers are as charmed as I am. To answer your question, I'd love to be more of a country girl. I'm out in the middle of no where, but no longer on a an old 15 acre farm. Now I live on a postage stamp and I don't even have room for a garden. But I'm a garden girl all the way! I'll be Ontario this weekend. So is Anita -unfortunately it's one big honking province. Thank you for visiting us, Valerie. Are you in BC? I'm just about two hours south of Vancouver, in WA. We used to have a lot of farms in my town. Now a Kmart, Walmart, AM PM, Jack in the Box, and a bunch of condos have all taken over. It's sad, really. But the central part of my island still has a few farms. Your book sounds cute, Valerie. Deb, thanks so much for stepping in for Anita and getting my blog post up. I live really close to the border, too. For us, having a passport is a necessity as Spokane is our closest city and airport. Hi Suzie! Yes, I'm in BC, just north of Idaho, so quite a distance from Vancouver. I'm a city girl who lives on 3 acres just outside the nearest town, population 2000-ish. Don't have a garden yet, but I want one. I've been saving reusable glass jars because I'm going to get my mom to teach me how to can. What I don't like about country life are the spiders and scorpions. One of the latter fell through a ceiling vent last night. Was about 3 inches long and still very alive. 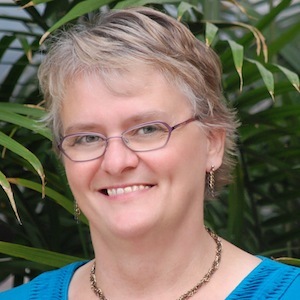 Congrats on your new release, Val!!!! Could you tell us and your readers more about Choose NOW publishing? Gina - only use real canning jars, not jars from the grocery store like mayo or spaghetti. Those may shatter in hot water. CAnning is a fun way to spend a hot muggy day in August... not! but great eating in the winter! I live in the "City of Chesapeake" (official name) so it sounds like I'm a city girl -- except it's really a jurisdictional-government-organizational thing and it's more like a county (just with a mayor and city council instead of county board). Still a number of really large (thousands of acres) corn/wheat/soybean farms (and peanut farms a bit to our west), and smaller truck stop and horse farm type places of under 100 acres. Which means, even though I write my checks to the "city," we have several acres. We've done vegetables with various levels of success in the past (the critters seem to get more than we do), but we're more into fruit -- peaches, blueberries (southern variety), raspberries. Now that I've figured out how to keep the pesky squirrels out of the peach trees, I may try strawberries again and see if our contraption works for them too. Oh, and we have chickens. Usually around a dozen, give or take. Gina, I'm going to disagree with Deb, but only by a matter of degrees. You can use non-"official" canning jars if you're just doing a hot water bath (acidic produce like tomatoes or peaches). The problem is getting lids that fit because you cannot reuse lids. Canning jars have standard lids that you can get at any hardware/discount store. Definitely never use non-canning jars for items that require a pressure canner (most vegetables, all meats). The non-"official" jars are often not study enough to withstand the pressure. Yard sales and thrift shops are good places to find canning jars if you don't want to pay full price. Good luck with the book, Val! Oh, and have you ever watched John Denver singing that song on Youtube? I'd only ever heard the song on the radio. One day, I thought I'd play it for my son (the fiddler), so I found it on Youtube. I didn't know JD played the fiddle! (Okay, he was no Charlie Daniels, but still, he was playing the fiddle part.) The things you learn on the Internet. Oh, goodness. I am SO thankful for people who love the farming life. It's so important. But it's oh so not for me. I don't like dirt, heat or bugs, so that pretty much rules me out. But I love animals and wide open spaces and the simplicity of farm life, so I definitely admire it. Thank you Deb!!! I certainly owe you a big coffee the next time I see you because I really appreciate you stepping in and working with Val on this. And Val, so sorry for ducking out. I had planned on going east at the start of July, but then found out my mom's sister was flying over from France - and bringing her son from England whom we'd never met - at the end of July so had to adjust. Then a week before I was due to leave my sister became available to make the trip so I waited for her vacation days. Talk about hectic! The trip was physically exhausting, mentally draining, and highly emotional. I'm so thankful for all of your support, especially when I was unable to communicate on internet or 3G due to monopolies on communications systems. I mean really, frustration isn't the word for what I was feeling. However, I treasure the time I was able to spend with my sister as we went over memories - both good and bad - and enlightened many dark areas. Putting our memories together, we found many of the old houses we used to live. It's strange how places look different when you're an adult looking with old but more experienced eyes so they seem new. Whatever it was, this new memory of our trip together is one I'll keep close for a very long time. Hey Gina, What I wouldn't like about country living where you are is the snakes. Shudder. Around here I might see a garter snake every few years, which is plenty often enough—even though I know they eat mice, and I thank them for it. My son has a t-shirt that says: I eat local because I can. I agree with C.J. Any jars you save for canning must fit standard canning lids and are best used for water bath canning: Water Bath Canning. Should you get into pressure canning, you'll definitely want real canning jars. Watching John Denver play the fiddle for that song caught me by surprise the first time, too! He put on a respectable show. Wish we could grow blueberries but it would be a constant battle with the pH of our soil. We are so far from acidic enough. Bah. Sounds like you can successfully grow a lot of variety. Fun! Wow, Anita, that IS a ton of driving. Family time is important, and I'm glad you and your sister got to work through some stuff together and that you had the privilege of meeting other family members in Ontario. Welcome to the Inkwell, Valerie! Your book sounds fun. Thanks for the link to Choose NOW, too. I live in an agricultural area so I'm blessed to benefit from an abundance of local produce at the local farmer's market. We grow tomatoes, herbs, squash, and stone fruit in our yard--organic and delicious. We didn't garden growing up, but the gardening bug hit after we were married when I met hubby's father and he taught me about seeding and transplanting. When we moved to Eastern Ontario after 12 yrs of marriage, we de-sodded a large portion of our 1/2 acre property, added 5 truckloads of mushroom compost, and grew the best veggies EVER. We won oodles of fair ribbons with our peppers, tomatoes, potatoes, corn, squash, etc and we canned everything. I took the course and became a Master Gardener. I didn't know which varieties best suited that zone, so I became a Test Gardener for Alberta Agriculture. Each year they'd give me 5 or 6 varieties each of Corn, Peas, Beans, Cucumbers and Pumpkins/Squash. I had to plant them, care for them, and harvest them. My records included how many seeds I planted per foot, and how much produce those seeds produced. That mean counting and weighing everything, and adding them into a computer program, then sending Alberta Ag the results. Lots of work, but free seeds and I got to keep all the produce. I also discovered what grew best in that area. The long days where the sun didn't set until 10:30 pm sure helped everything grow. That ended when we retired and moved to Saskatchewan and took over the family greenhouse operation where we grew bedding plants and sold to farmer's markets and local Co-op stores. We had our own garden for 'leftovers' but by the time greenhouse season ended, we had been going full steam since Jan and were drained. And we could never get our garden growing like our Ontario nor Alberta ones possibly because we are now in a 1b Garden Zone. When we moved to our farm in 1999 we tried market gardening. We flooded, battled hard ground, and encountered frosts in June, July or August which can be deadly to the plants if we miss the radio or TV broadcast. And how do you cover rows upon rows of corn? And what the frost doesn't kill, the wind whips apart. We have a smaller garden between the lilacs and apple trees, but the soil is so sandy it won't retain water so loads of compost are needed. We have aged compost from cleaning out the barn, but the gardening needs to be done in the spring when the ticks are out. After much experience with the little suckers, I am now petrified of ticks and refuse to go into the garden until the 3rd week in July when tick season is over. Unfortunately by that time, garden season is almost over as well. So at this point in my life while we live on this beautiful 160 acre farm, I don't garden at all. However, it took 5 yrs, but we have been able to Certify our 100 cultivated acres as Organic for Grain growing. "Country lit is the next big thing"... REALLY? I love that! Love the border collie on your cover. We had two border collies for years. They are amazing animals. Wow, Anita, you've battled a lot of odds to garden over the years. I'm sure you can out-wit those ticks, too. Congrats on being certified organic. We ARE organic but haven't jumped the hoops to certify on our little farm. Pigweed is nasty stuff, Niki! I'm constantly yanking it out everywhere in my garden, but there's always more where it came from. Sigh. I do manage to keep it back enough to get veggies. Domino is glad to hear you like him on the cover. He's rather important to the entire story. You could call it a love triangle: man, woman, dog.